1 Put the sauces, lime zest and juice in a shallow dish and mix together well. Lay the salmon fillets in the marinade, flesh side down. Leave to marinate for at least 20 minutes. 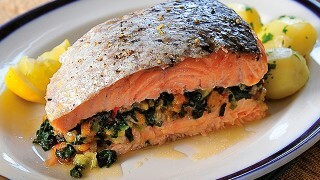 2 Preheat the grill to high and place the marinated salmon fillets, skin side up, on a baking tray under the hot grill. 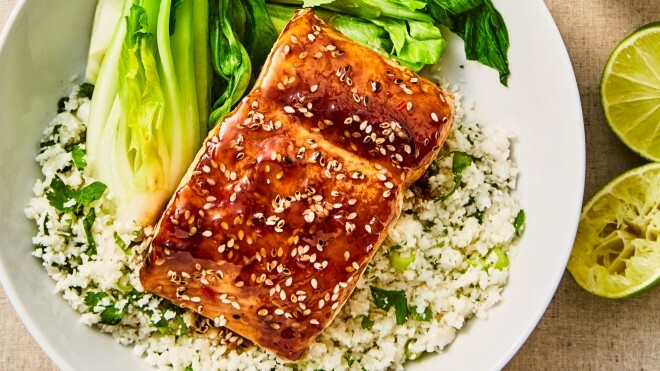 Cook for 5 minutes, basting with the marinade, then turn over, sprinkle with the sesame seeds and cook for a further 5 minutes, until the seeds are toasted and the salmon is cooked through. 3 Steam your pak choi whole for 2-3 minutes. 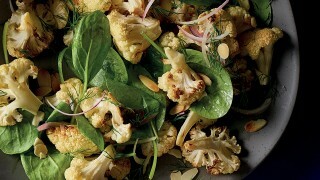 Chop the cauliflower into florets then blitz in a processor (or chop) until it resembles rice. Serve raw, or for a fluffier texture we suggest you lightly steam it for just a couple of minutes. 4 Stir the spring onions and coriander through the cauliflower rice and top with the salmon fillets, spooning over any excess marinade left in the baking tray. 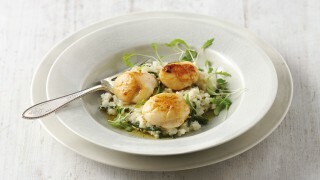 Serve with the steamed pak choi and half a slice of lime.